Sewing can be an effective way of adding interest and dimension to your pages without being overwhelming and bulky. This week, Kelley shows you the subtle effect stitches on your page can have as she combines the technique with Chatterbox papers. This layout was created with papers from the Chatterbox Bunkhouse Room Collection (two sheets of Bunkhouse Den Stripe Cardstock, one sheet of Bunkhouse Stripe Cardstock, one sheet of Bunkhouse Argyle Paper and one sheet of Bunkhouse Dots Paper), white thread, black ink, alphabet stamps and a selection of coordinating ribbon. Use your two sheets of Bunkhouse Den Stripe Cardstock for your background. Cut two strips of Bunkhouse Argyle Paper and adhere them horizontally across the bottom of your pages. Make sure when the two pages are sat side by side that the strips match up. Using white thread, sew along the top and bottom of these strips. Mat two vertical photos with Bunkhouse Dots Paper and two horizontal photos with the red underside of one of your papers. Do not fully adhere the horizontal photos. Leave a gap so you can tuck a tag in behind them. Position your photos on your layout and sew around the edges with white thread. Mat your remaining photo with and cut in half. Position the left half on the left-hand page and the right half on the right-hand page so they line up with each other. Sew around the edges with white thread. Cut out two strips of red and brown diamonds. Sew vertically to the left and right edges of your page, as shown above. 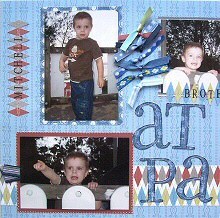 Using alphabet stamps, stamp a word (in this case, the names of the boys in the photos) on top of your diamond strips. Repeat this process with blue and gold diamonds to create the small horizontal title spanning two pages. Cut out the letters from your main title from Bunkhouse Dots Paper. Lightly ink the edges with black ink and sew onto your layout, as shown above. Select an arrangement of co-ordinating ribbon. Sew them in place, as shown in the layout above and then tie them. Finally, cut out two tags and add journaling. Attach ribbon to the top of each tag and tuck behind your two horizontal photos.